David Johnson seems an unlikely person to write a book about the Gospel of John. He had a long career as a geology professor and co-authored a standard textbook on the geology of Australia. His book reveals that when he first felt drawn to read the gospels, he did not speak about it to others. Yet it’s clear from his writing that careful reading of the gospels, meditating on them, living with them, and learning to follow the teachings of Jesus, including the inward teachings, transformed Johnson’s life. In 2007-2008, he spent eight months reading nothing but the Gospel of John, verse by verse. In his book, Jesus, Christ and Servant of God: Meditations of the Gospel According to John, he shares what became clear to him through that time. Drawing on passage after passage of words spoken by Jesus, and from his own spiritual experience as he turned to the living Christ guiding him from within, Johnson draws a map of the spiritual journey to which Jesus invites his followers. He reveals, as well, an emphasis in the words of Jesus that has been overlooked in mainstream Christianity, but which is very consistent with Quaker understanding and experience since the beginning of Quakerism in the seventeenth century. I expected this book to focus primarily on David Johnson’s personal experience living with the teachings of Jesus recorded in the Gospel of John. Though his own journey clearly informs his insight into the meaning of the gospel, in the book he reflects primarily on the stories and teachings of the gospel itself. Rather than say a great deal about his own experiences, he sometimes includes passages from the experience of early Quakers to illustrate how the teachings of the gospel have been experienced by Friends, and occasionally he quotes others, including Thomas Merton. 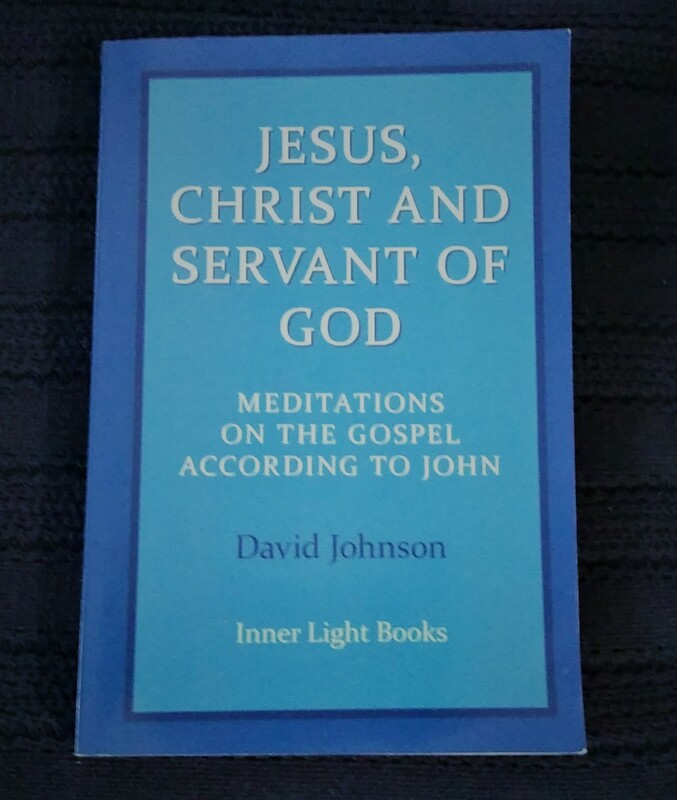 Jesus, Christ and Servant of God: Meditations of the Gospel According to John, can be ordered from Inner Light Books in hardback, paperback or ebook versions, as can Johnson’s earlier book, A Quaker Prayer Life. Our Life is Love: the Quaker Spiritual Journey, by Marcelle Martin, is available from Inner Light Books in hardback, paperback, and ebook. (An excerpt and a study guide are also available on that website.) Designed to be a resource for individuals and groups to explore their spiritual experiences, the book describes the journey of faithfulness that leads people to actively engage in God’s work of making this world a better place for all. To order multiple books for a study group, postage free, contact us. For information about other upcoming courses and workshops with Marcelle, go to Teaching and Upcoming Workshops. I am a Quaker writer, teacher, workshop leader, and spiritual director. This entry was posted in Contemplative spirituality, Quaker Faith Today, Radical Christianity and tagged Australian Quaker, David Johnson, Gospel of John, inward Light, Jesus, Light of Christ, Pendle Hill Retreat Center, spiritual rebirth. Bookmark the permalink. Thanks, Kate! You are one of my best proofreaders! I’m glad that this encouraged you to read John.